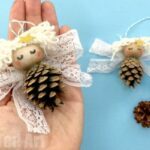 Many regular readers of my bog will know that we love both Pom Poms and Clothes pins dolls – the make perfect Christmas Ornaments. so it really it was only a matter of time before i had a go at combing the two. Pom Pom Fairies seem to be everywhere at the moment. I was particularly inspired by this rainbow Pom Pom Fairy Garland and these Ornament Fairies (the latter with no instructions, boo hoo). 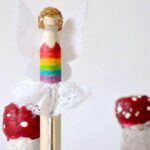 So I decided to have a go at our very own Pom Pom Dolly Pegs and share how we did it with you here.. the first Pom Pom Fairy I made was FAR too fluffy and HUGE and I had to thin out a LOT of the wool. 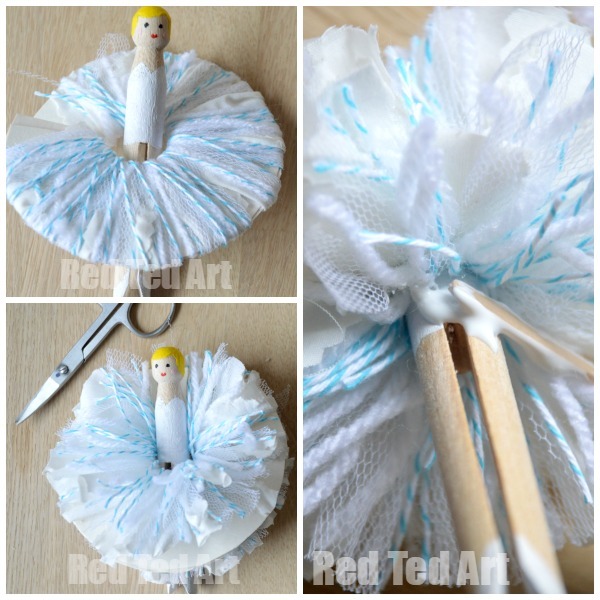 So, I have shared the photos of the second pom pom fairy (our white Dolly Peg Angel), so you can “learn from my mistakes”!!! 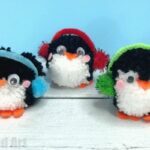 Check out our other Dolly Peg Crafts and all our Pom Pom Crafts (including 7 different ways to make a pom pom!!!). 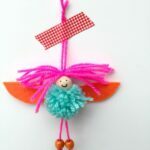 These Pom Pom Fairy Peg dolls were first published in Oct 2014 and updated and republished for your convenience! Begin by painting your fairies bodies – make sure you peg is “facing forward”, when you add the face and the bodice details. You CAN draw no pegs with felt tip pens, unless you have very “grainy” begs. The smoother the peg the better. I use felt tip pens for the kids and paints for me. Paints however will always work really well. 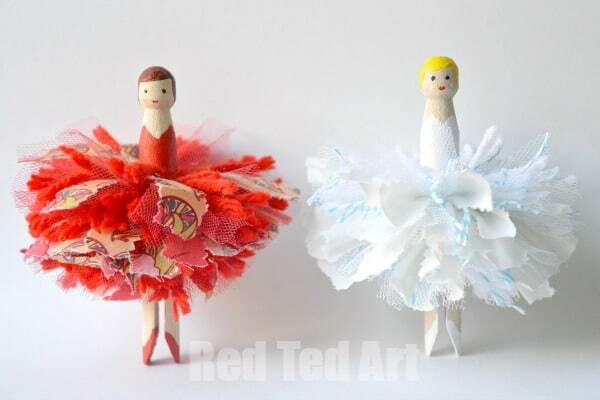 We popped our Clothes Pins Fairies on a TP Roll to dry (don’t you just love TP Rolls?!). 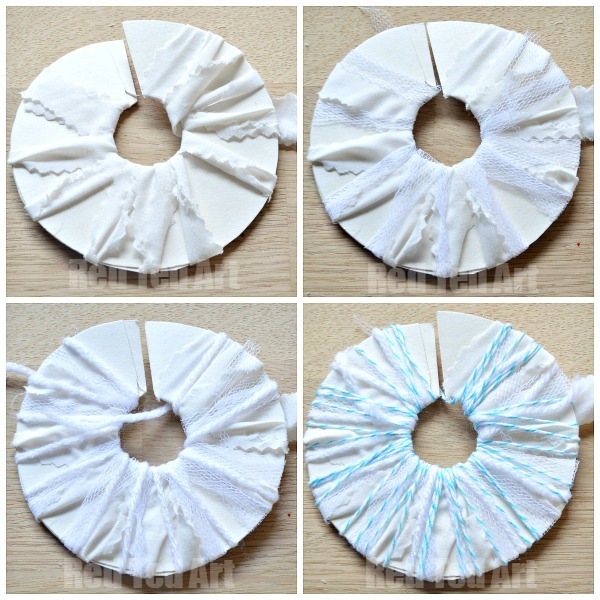 Once dry you are ready to make your pom pom fairy! Find some scraps of fabric and wool and baker twine. I cute the fabric with pink pink shears to avoid too much fraying or our Pom Pom Fairy over time. Cut 2 pieces of circular card approx 10cm in diamter, with a 2cm hole (see picture). You don’t want the hole to be too big, else it will all fall apart when you insert your clothes pin and cut later on. I wrapped a thin layer of each material to make the pom pom – check the photos to see – and you will not, that it is NOT tightly filled. 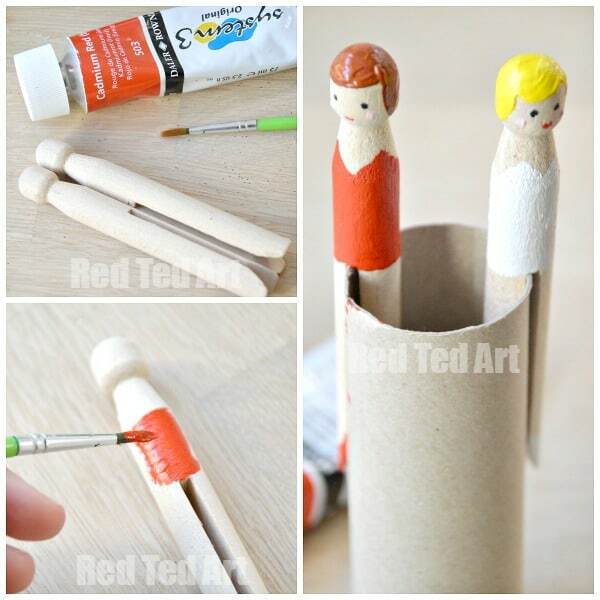 Insert your painted Clothes Peg. Then carefully snip between your two pieces of card. Be careful to avoid the “bits” falling out. 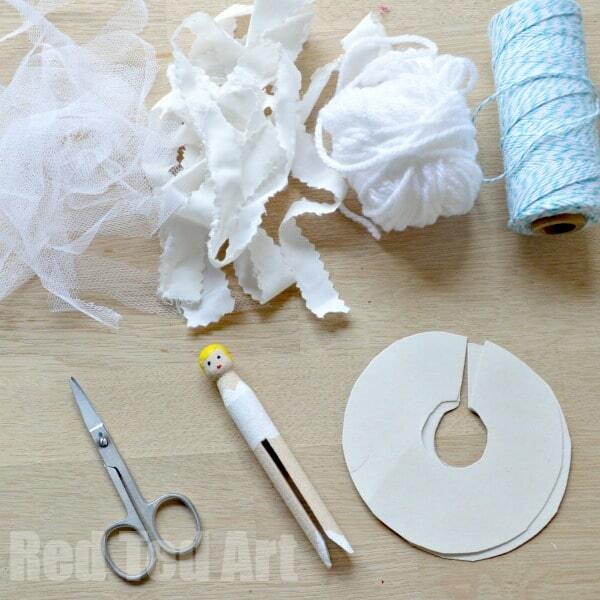 Carefully wrap some bakers twine BETWEEN the two pieces of card and pull tight and knot. In theory this is all you need to do. But I want my kids to play wit their Pom Pom Fairy Doll, so I also lifted up her skirt and tabbed some PVA glue to help secure all the strands. Let fully dry and you are done! You can always add some fairy wings to your pom pom fairies – cut them out of felt, paper, card or use some “skeleton leaves”. 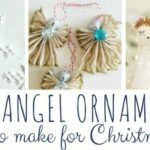 They would look really pretty, you can then glue some ribbon to the back and hang your pom pom fairy into your Christmas tree if you want.. or by your child’s bed for lovely dreams! 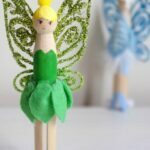 To help you on your crafty quest here are some helpful affiliate links to help make your clothes peg fairy!! 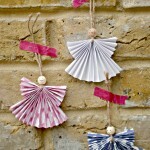 Have lost of fun making your Pom Pom Clothes Pin Fairies!! 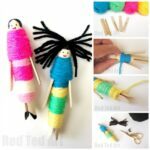 Loving your peg dolly ideas! thank you, am having fun! It doesn’t say on the instructions, but I assume you get rid of the cardboard ? Yes, it is only there temporarily! Let me add it to my video “to do list”! I love the Pom Pom Clothes Pin Fairies but I cannot do a copy and paste and saw nowhere that I can download it directly. How do I get this pattern for my files to do at a later date.? Hello! Yes, I am aware that that is a problem! That is why I created this FABULOUS book for you guys to download – https://www.redtedart.com/christmas-ornaments-book/ hope you like it!!! !